Now this is a duck that catches the eye. I remember the first time I saw it about 20 years ago at La Mirada Regional Park. I couldn't believe my eyes. It was gorgeous, and the sail-like feathers rising out of its wings were so unusual. Afterward, I kept hoping to see another at every park with a lake I visited. I saw a female a few years ago, but no male. Finally, I saw another male Mandarin Duck recently when I was out for a walk. Mandarin Ducks are perching ducks native to Siberia, China, and Japan. However, in the United States, they are an exotic species. Most Mandarin Ducks in the United States are thought to be escapees or the descendants of escapees. There is a small feral population of Mandarin Ducks in California. Mandarin Ducks are a close relative of the Wood Duck which is a native species. Mandarin Ducks hybridize with another our native Wood Duck who is also a perching duck and rather flashy itself. Female Mandarin Duck at Huntington Central Park near Huntington Lake. The Male Mandarin is a pretty flashy fellow, and he does attract females from both the Mandarin Duck species and from the Wood Duck. However, due to the extra chromosomes, Mandarins cannot successfully produce hybrid offspring like other ducks. Breeders say they may mate and produce eggs, but they do not hatch. (I am still looking for back up on the lack of offspring in literature.) He is a faithful fellow though, sticking around for several seasons with the same female and taking part in guarding the nest. For these reasons Mandarins are considered a symbol of faithfulness in Asia. Male Mandarin Duck. Check out those interesting sail-like feathers. The female Mandarin Duck is more plain. She is very similar in appearance to the female Wood Duck. The female Mandarin has what look like eye glasses. She has a thin circle around the eye and a line from the circle toward the back of her head. The female Wood Duck's eye is in a white tear drop. Check out my post Wood Duck or Mandarin Duck? for more details. Mandarin Ducks eat seeds, grain, acorns, insects, mollusks including snails, fish, and water plants. They prefer areas with water such as streams, ponds, and marshes that are near forested or woody areas. Mandarin Ducks nest in holes in trees and will utilize nest boxes like the Wood Duck. Like the Wood Duck, the Mandarin Duck's ducklings jump down from the nest which can be higher than 25 feet in the air. The mother jumps down first and calls them. The ducklings jump down to follow her. Besides the United States, feral populations of Mandarin Ducks exist in England and Scotland. In Orange County, Mandarin Ducks appear at different rivers, streams, ponds, and lakes sporadically. It is impossible to predict where they may show up, but places like Huntington Central Park, Irvine Regional Park, Mile Square Park, Craig Regional Park, the Santa Ana River, San Joaquin Wildlife Sanctuary are possibilities and other locations are possible. Male Mandarin and female Wood Duck seemingly a couple. So if you are out birding in Orange County and see a Mandarin Duck, count yourself lucky. It doesn't happen every day. Cedar Waxwings hanging out near a window--lucky for me. I was standing in front of a wall of windows today when I saw a large flock of birds fly in. I guessed it might be Cedar Waxwings, and it was. They have been hanging out in the industrial area near Cypress due to all the trees and bushes with fruit. They have been here at least since fall through spring. Cedar Waxwing rests between berry binges. The flock numbered about 40 Cedar Waxwings. Seeing birds where I work is a pick-me-up. Be aware of your surroundings. Even in places you don't expect it, you can see some pretty amazing birds right were you are now. 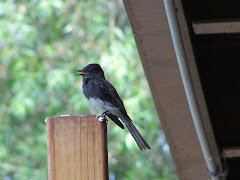 Birding in Orange County doesn't mean that you have to go to a nature preserve. The birds gather were there is food, water, and shelter. So don't forget to check out the places where you live, shop, or work. You might just find an interesting bird. Lake at Irvine Regional Park. On Saturday I took a walk in Irvine Regional Park in Orange. There is something so relaxing about Irvine Regional Park. I parked by the lake and stopped to see which birds were at the lake. The ducks were swimming quietly by. All the drakes were in eclipse plumage. The Mallards and Wood Duck drakes where decked out in plumage that was very different from their usual flashy feathers. Mallard drake (male) in eclipse plumage looking similar to the female Mallard. You can tell he is a male by his yellow bill with no black on it and the brown patterns on his chest and sides. 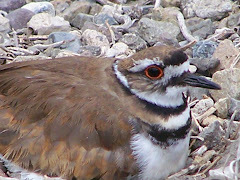 The feathers on his chest and sides are tipped with a chestnut brown color. The males also have a little curl in their tail feathers, but that is not diagnostic since in molting, they often lose those curly tail feathers. Female Mallard. Diagnostic field marks: Orange bill with black on top. Another female Mallard. Note the black on her orange bill. Mallard drakes in eclipse plumage look very much like Mallard hens. The difference is subtle. A female Mallard has an overall brown appearance and an orange bill that has a lot of black on the upper mandible. However, the male while also brown, has patterned chestnut sides and chest and a yellow bill without any black. Although the male also has curled tail feathers, they are often lost in the change from breeding plumage to eclipse plumage and the change back to breeding plumage. So curly tail feathers are not a reliable field mark for male Mallards. Male Wood Duck in eclipse plumage. Wood Duck drakes undergo an even more extreme change. Not only is there a change in color, but he loses his beautiful crest. He looks drabber and a bit odd. The female Wood Duck doesn't seem much different that her year-round plumage. Irvine Regional Park is a reliable place to see Wood Ducks as is Craig Regional Park in Fullerton. At both places you can on occasion also see Mandarin Ducks which are a close relative of Wood Ducks. Mandarin Ducks are a non-native species that are most likely escapees or descendants of escapees. They are natives of Asia and are sometimes kept as exotic species at zoos. 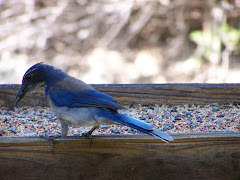 We see them sporadically at parks an nature areas with lakes in Orange County, CA. They are cavity nesters like Wood Ducks. It is impossible to predict where you might see them. Although they are not native, I always love seeing Mandarin Ducks because they are so beautiful. In spite of all its amenities including a children's railroad, pony rides, playgrounds, and the zoo, Irvine Regional Park is full of native plants, trees, birds and other animals. 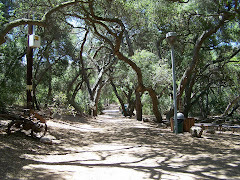 The Oak Woodlands that cover much of the main park are quintessential Southern California. Their dark branches twist and turn, and let a little light through to light up the areas under them. They provide food and shelter for the birds and other animals who live and migrate through Orange County. Squirrels, woodpeckers, nuthatches, and Wood Ducks are among the animals that use the coastal live oaks for food and shelter. Also found among the coastal live oaks in the oak woodlands are California sycamore, California black walnut, cottonwood trees, and pine trees. Great oak woodlands can be found in many other areas of Orange County such as Santiago Oaks, Oak Canyon Nature Center, O'Neill Park, and many other parks and natural areas. California black walnuts have a much smaller amount of meat than the walnuts you find in the store, and the shells are very hard, but they were used as food and money by the Native Americans who lived in Southern California. California black walnut trees can be shrub-like or they can be trees up to 30 feet tall. You will find them in many places in Orange County and in Southern California. Here is a California black walnut still on the tree. The leaves are distinctive. A large California black walnut tree. Birds that eat the nut meats from the California black walnut are towhees, grosbeaks, finches, thrashers, titmice, and crows. 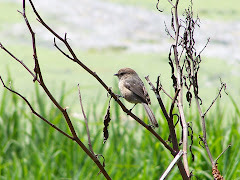 Bewick's Wren--one of several wren species in the park. By a leaky sprinkler there were Bewick's Wrens, Bullocks Orioles, Anna's Hummingbirds, Lesser Goldfinches, and lots of other little birds. Water is a big draw for birds of all kinds. Even something as small as a little leaky sprinkler becomes a busy watering hole. The nearby wagons and trees became perches for the birds as they checked the area out for predators before going down for a drink. Bewick's Wren on the wagon wheel. Old wagons and a sprinkler leaking. Acorn Woodpecker on phone pole being used as a granary tree. I walked over by the zoo to catch a look at the Acorn Woodpeckers that have turned a telephone pole into a granary tree filled with acorns. And also to check out the flowers for hummingbirds and butterflies. Over by the zoo are California fuschia and other plants that attract butterflies and hummingbirds. I could not get a clear picture of the hummers, but did get a few of a Western Tiger Swallowtail. This was one noisy male Peacock. Peacocks can be found anywhere in Irvine Regional Park, but they are found especially by the horses and the zoo. They are not native species, but can be found in the hills around the City of Orange. Peacocks aka Peafowl have been raised by people in Southern California over the years and are periodically released or escape. There are colonies in several Southern California areas such as Palos Verdes Estates, the City of Orange, and Arcadia. In spring and summer, they call loudly looking for mates sounding like a cat on steroids. It can be unnerving. As this Peacock shrieked, a small boy, hands over his ears, implored his mother and grandmother to "Make it stop!" He was frightened. His mom explained the Peacock was looking for the mother peacock which somewhat mollified the boy, but he still looked relieved to be moving away from the caterwauling peacock toward the zoo entrance. Going back for another splash in the lake. The strangest thing I saw was a Western Kingbird flycatching insects off the surface of the lake. It would swoop down and splash into the water. Then it would go up in the tree to dry off, and then do the whole thing again. 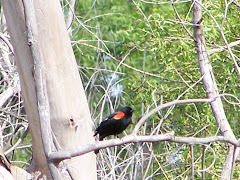 The next time you are looking for a place to go birding, try Irvine Regional Park.